f.21 'Panniput 1792. 54 miles north of Delhi in Bengal.' Landscape with city in the background. bl.uk > Online Gallery Home	> Online exhibitions	> Asia, Pacific and Africa Collections	> f.21 'Panniput 1792. 54 miles north of Delhi in Bengal.' Landscape with city in the background. 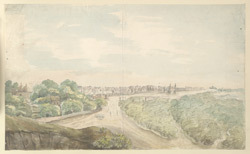 Pen-and-ink and wash drawing of Panipat by James Tillyer Blunt (1765-1834) in 1792. This is one of 31 drawings (29 folios) of landscapes in Delhi, Uttar Pradesh, Bihar, Orissa, Madras and Mysore made between 1788 and 1800. Panipat is located in Haryana & Punjab, Northern India, on high ground overlooking the old course of the Jumna River. It is renowned as the site of three important battles which mark the rise and fall of the Mughal Empire. In the first of these great battles, on 21st April 1526, Babur defeated the combined armies of Ibrahim Lodi, last ruler of the Delhi Sultanate and the Hindu Raja of Gwalior. This marked the foundation of the Mughal Empire. Thirty years later the Mughals saw off a challenge from the Pathan dynasty. On 5th November 1556 the Mughals, under Babur's grandson Akbar, defeated the forces of Sher Shah and Mughal power was re-established. Two hundred years later the Mughal Empire was threatened by the Rajputs from the west and the Afghans from the north-west. The Mughal minister called in the Marathas and the battle which took place on 14th January 1761 was essentially a struggle between the Marathas and the Afghans. The Afghans were victorious over the larger force of Marathas but despite his victory Ahmad Shah Durrani faced a mutiny by his followers as he had failed to pay two years of arrears of pay. The subsequent political uncertainty lay the Empire open to invaders.